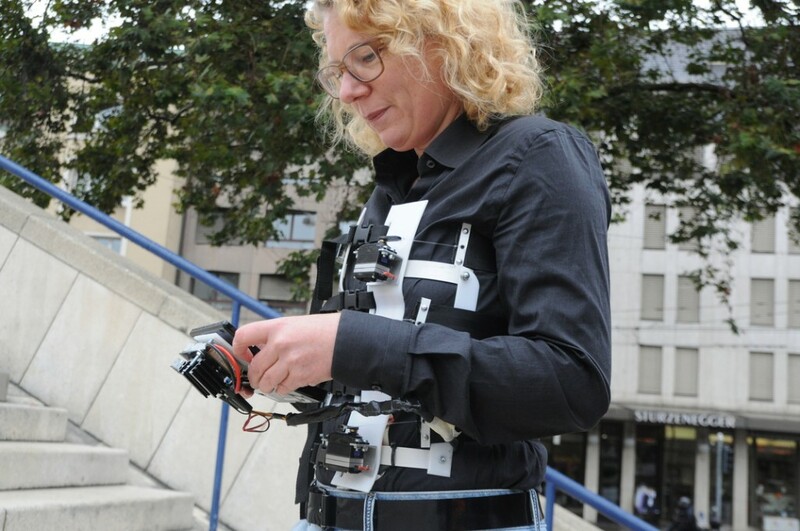 For the first time I am going to use the Constraint City Android app with new servo motors from Dynamixel / Robotis from South Korea and a completely redesigned corset with 3d-printed parts to make the constraint walk even more “pleasant”. 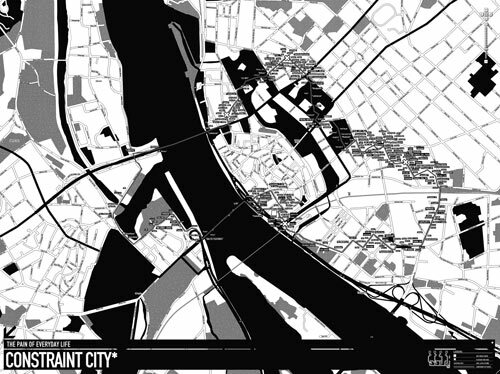 Constraint City took part in the exhibition “Sensing Place. 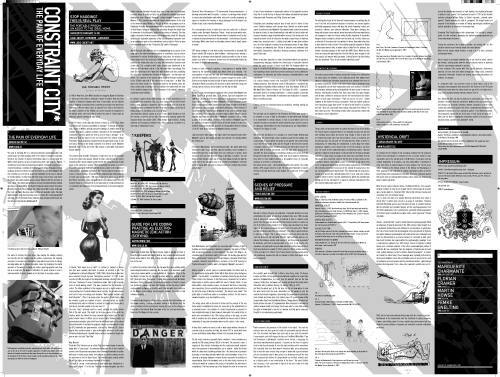 Mediatizing the Urban Landscape” which compiled the Crème de la Crème of artworks/designs dealing with the augmentation of electromagnetic signals in our urban environment. 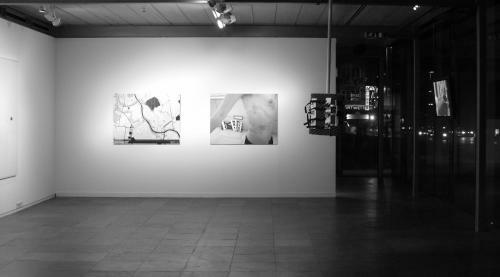 Works by Mark Shepard, SENSEable City Lab and Christina Kubisch are featured, just to name a few. In the words of curator Sabine Himmelsbach, the exhibition seeks to address this reconfiguration of the public space by means of an increasing overlap of the digital spheres of information and geographical reality. > citizens. Unfortunately, the Constraint City walk got overshadowed by a heavy rainstorm, but we still tried to capture some waves and light bruises augmented by the Constraint City vest. on-going exhibition and symposium series initiated by Trampoline. 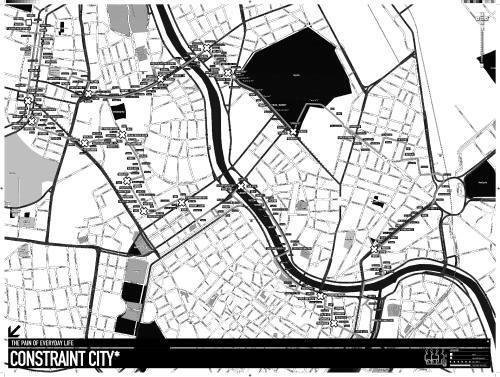 Check out their workshop program, symposium and of course the exhibition titled “Tracing mobility: Cartography and Migration in Networked Space” in Berlin from 24 Nov 2011 to 12 Dec 2011! 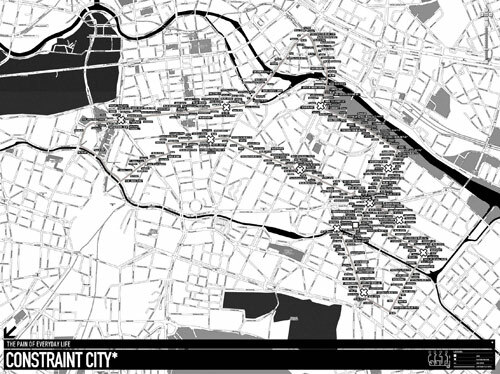 Constraint City can be experienced on Friday 14th of May 2010 as part of the Radiator Territorial Play Festival. Drop by at 2pm at Broadway Media centre where our Constraint Nottingham trajectory will start. Taking a curatorial lead from the wider themes of Radiator’s Tracing Mobility programme, Trampoline will present the first in a new series of platform events, called Territorial Play. This event will launch the Tracing Mobility programme and seeks to illustrate and annotate the critical debate of the Tracing Mobility Symposia by presenting a day long event of performances, screenings, live music, pervasive & locative gaming and artistic interventions. Territorial Play will feature the work of emerging artists by submission alongside many of the international artists participating in the symposium. Oscar Abril Ascaso invited me to participate in his project Techformance which will take place around Murcia/Cartagena and will eventually be shown at ARCO Madrid, one of the biggest art fairs in Europe. I’ve been invited to do a public performance with some citizens from Cartagena interested in trying out the Constraint City jacket in January. It was an interesting experience watching other people than me wearing the corset. Around eight people (3 women among them!) wore the corset and subjectively experienced an enhanced psycho-geographic walk through emblematic signs and ancient monuments in the maritime city of Cartagena! 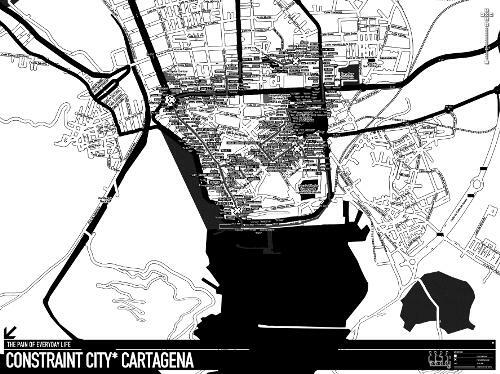 The walk has been recorded and each progressively attacking network has been rendered into a Constraint City map of Cartagena. A hub of participatory projects inviting visitors to the art fair and citizens in Murcia alike to take part in real time from February 11th to 16th 2009. All other selected works are presented on the Techformance website (both in english and Castellano). Take a look and contact me if you are around Madrid. I’ll be there from 11th till 13th of February! 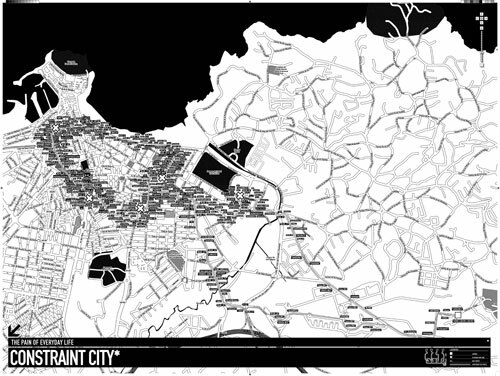 The project “the pain of everyday life” is a city-intervention and a digital art performance addressing public and private space within the realm of everyday constraints. It resembles an urban interface for an invisible city, an architecture which is subconsciously perceived and which constantly oscillates as resonant landscape, consisting of electromagnetic waves. 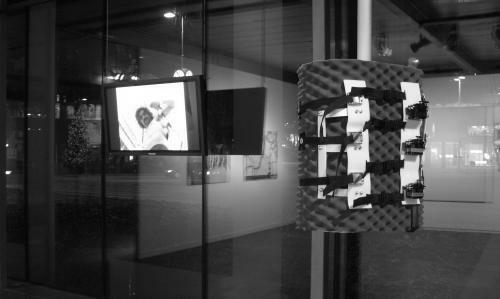 A chest strap (corset) with high torque servo motors and a WIFI-enabled game-console are worn as fetish object. The higher the wireless signal strength of close encrypted networks, the tighter the corset becomes. Closed network points improve the pleasurable play of tight lacing the performer‘s bustier. Thus, constituting the aether as a space of possible pregnancy, filled with potential access-points to the networks of communication. Everyday walks between home, work and leisure are recompiled into a schizogeographic pain-map which is fetched from GoogleMaps servers with automated scripts. By wearing the straight-jacket, the artist not only writes, but is at once also able to read the city code. 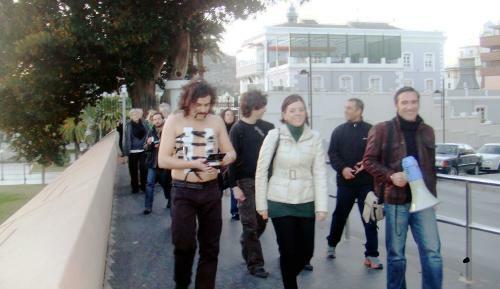 The outcome of his walk provokes an emergence of a city-shaped body. The map keeps not only tracks of all wireless networks along the route, but also the wearer’s détournement when entering a very dense network place, a so called pleasurable pain zone. Therefore, the artist becomes the 21st century flaneur who balances along sensual perceived pain and the torture of everyday routes in a very special Arcades Game Project. The friendly and very supportive people from RIXC invited me to this year’s festival Spektropija in Riga/Latvia with the focus of artistic explorations within the invisible electromagnetic field surrounding us. Riga Pain Derive (see below the map of Riga). Apart from the exhibition which takes place in Riga’s Maklas Telpa, there’s a 2day conference announced from 17th October, performances and a workshop with the the title TEMPEST, the latter organized by no other than Martin Howse. Take a look on RIXC’s website for the full schedule. 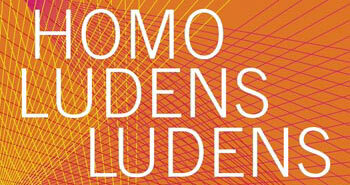 Homo Ludens Ludens, an exhibition hosted by Laboral, on-site from 18.04 – 20.09.2008. 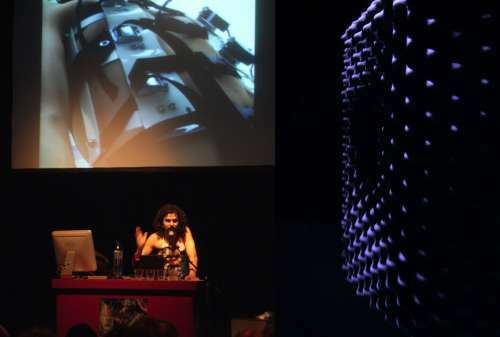 Furthermore, this weekend laboral will host a symposium exploring games as a critical element in our daily lives. transmediale 08. The kml file can be found here! Performance on 13/07/07 at V2 Rotterdam Eendrachtsstraat 10 during the Test_Lab PLAY evening. EXPERIMENTS OFTEN COMBINE A STRONG DIY ATTITUDE TOWARD TECHNOLOGY DESIGN WITH A DESIRE TO TAKE ADVANTAGE OF PEOPLE’S NAIVE OR INTUITIVE UNDERSTANDING OF TECHNOLOGY THROUGH PLAY. Marguerite Charmante: Stop nagging? This is RealPlay! Thanks to all text contributors and special thanks to Felix Wilke for graphix support & Jorgos Tornados who arranged great deal for offset print. Please drop me a line, if you want an exemplar. 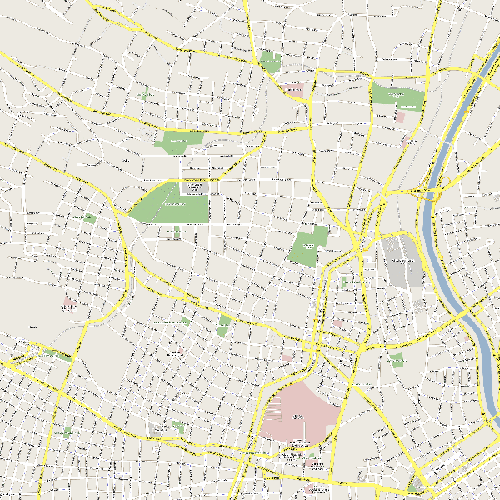 After rendering a 6000x4000pixel map from GoogleMaps using 256×256 image tiles, my script started to fail every time. 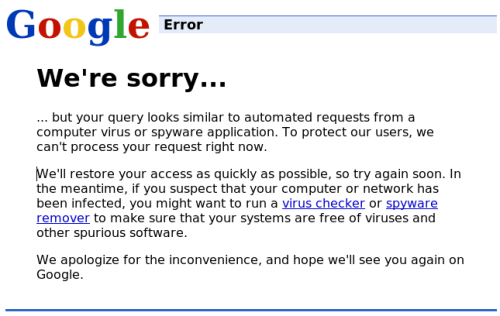 What seemed like a strange bug, turned out into a (once again) google restriction … OBEY! in 2005 and was a response to the heavy use of Google by Search Engine Optimisation companies to check on ranks of sites they were optimising. The message may also be triggered by high volumes of different searches from a single IP address. The block is removed after a day. which constantly re-assembles a resonant landscape, consisting of electromagnetic waves. It bypasses human, buildings as well as vehicles through the streets of a so called Maxwell City. 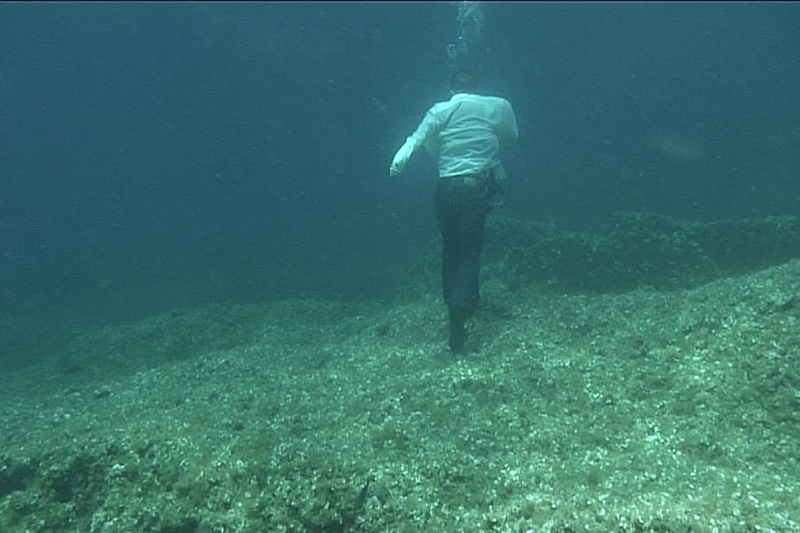 The restriction as such and its augmented invisibility are the source material for Gordan Savicic. A chest strap with high torque servo motors (muy fuerte mi amigo!) 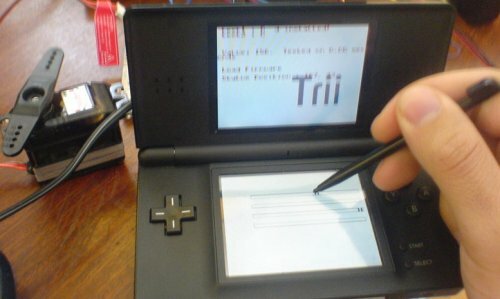 and a wifi-enabled gaming console (Nintendo DS lite) are worn as fetish object. Thus, when approaching an enclosed encrypted wireless network, the strap reacts immediately. The higher the wireless signal strength, the tighter the jacket becomes. This technique, also called Inverse War-Driving, challenges the much overhyped discourse about locative and wearable media. Everyday walks between home, work and leisure are recompiled into a schizogeographic* pain-map. The 21st century flaneur balances along sensual perceived pain and the torture of contemporary Arcades sans fil. By wearing the straightjacket, the Wandersmann not only writes, but is at once able to read the city code. 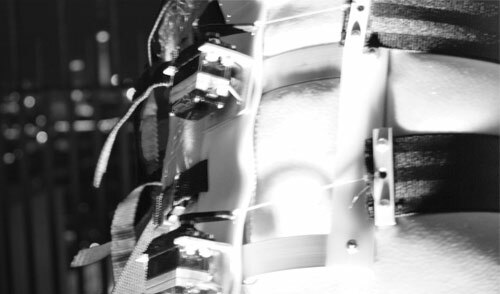 Electromagnetic waves are forming the chest strap, thus shaping the invisible architecture directly onto the human body. As another countermove the mapping procedure is recorded on a GIS-layered map which keeps track of ordinary everyday walks and its chosen alternative routes. By displaying the playful approach of the wearer, it reveals not solely a psychogeographic pain-map, but as a result also the wearer’s admiration for gentle tortures as well as the alteration of everyday routines in RealPlay. und formt anhand der empfangenen Daten die Corsage am Koerper. Das Brustkorbgeflecht der Jacke ist mit High-torque Servos ausgestattet. Je staerker die Verschluesselung und dichter das Signal, desto enger die Manschette und infolge, desto schmerzhafter bzw. unertraeglicher wird das Bewegen durch die unsichtbare Maxwell’sche City. Der Alltagsweg zwischen Arbeit, Zuhause und Freizeit wird re-kompiliert; der Flaneur des 21. Jahrhunderts balanciert entlang des lustvoll-rezipierten Schmerzes und der Qual in den zeitgenoessischen Arcades sans fil(1). Funknetzwerke sind das Geruest der ubiquitaeren Datenkommunikation und machen das Internet allgegenwaertig, wobei Privat und oeffentlicher Raum nicht mehr im herkoemmlichen Sinne existieren, viel eher in eine Parallel-welt ko-existieren, welche zwar nicht sichtbar aber sehr wohl spuerbar ist. Privatraum in drahtlosen Netzwerken wird durch Verschluesselungsalgorithmen und Zugangsbeschraenkungen definiert. “Ausgeschlossen sein” bedeutet nicht nur Behinderung im Zugang zum oeffentlichem Raum Internet, sondern eben auch einer nutzlosen elektromagnetischen Strahlung ausgesetzt zu sein. Auf aehnliche Weise artikuliert sich das Projekt von Gordan Savicic, jedoch wird es dem “Wandersmann” ploetzlich moeglich den Code der Stadt zu lesen, indem unerreichbare Wege der Funkkommunikation direkt auf den Koerper Einfluss nehmen. Der modifizierte Koerper ist der Balance-Act aus Schmerz und Vernunft. Im Gegenzug werden die geschriebenen Wege auf der Spielkonsole mitaufgezeichnet. Das Bewegungsmuster ist der neue Code, den die Stadt beschreibt und wird auf Papier als Momentaufnahme einer prozessuralen Datenarchitektur wiedergegeben. Die Karte ist somit die Inschrift eines psychogeographischen Schmerzmusters, sowie Traegermaterial fuer eine Reihe von Publikationsbeitraegen von u.a. Florian Cramer (GER), Femke Snelting (BE), Margarete Jahrmann (A/CH) und Martin Howse (UK) zu RealGaming, Corsagen und Walking Practices. Die Publikation wird im Format eines Stadtplanes erscheinen und Teil der Ausstellung.